In my search for an alternative, several online posts and comments from TripAdvisor, Lonely Planet and Airliners recommended using TicketIndonesia.info. 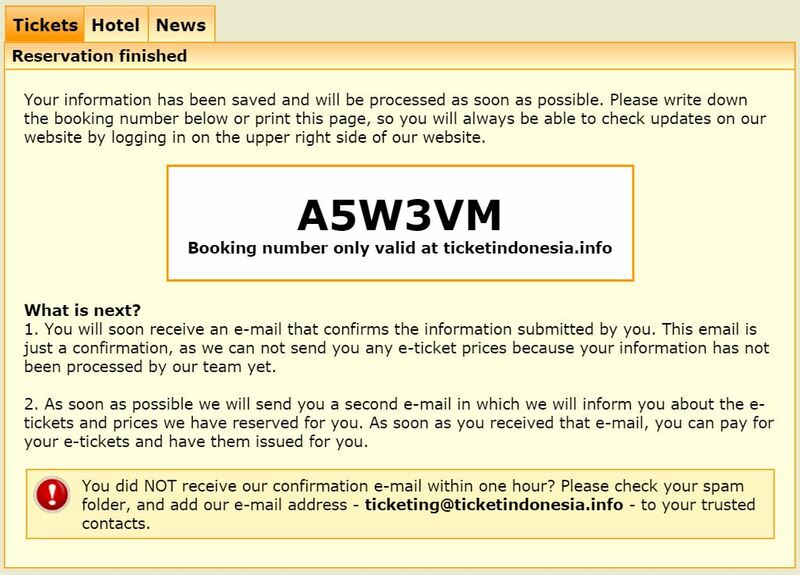 After unsuccessfully trying to book on Tiket.com, I decided to give TicketIndonesia.info a shot. The site didn’t have the nicest-looking design, but I’ve used far worse websites in the past booking international trips so this wasn’t a deterrent it would have been several years ago. The next step is an email confirming that TicketIndonesia.info received your information. In the meantime, the company secures ticket(s). After securing the ticket(s), they’ll send out another email pointing you to their reservation website to pay (+ reservation fee). From there, they’ll issue your e-tickets. Your e-tickets are being booked in a system for airlines which is not connected directly do this website. Because of this we can only confirm your e-ticket prices after we have processed your reservation. Reservations made are completely free of charge and don’t oblige you to purchase anything. Prices are exclusive of reservation fees. We have processed your earlier request and have already published the corresponding prices for you. Below is a short summary of the flight(s) that we reserved for you. With your booking number [######] and a lastname of a passenger you can login to the website below to view the total amount, a specification of this amount and send us your payment. You will have the choice between iDEAL, Moneybookers and more. Click here to logon to the website. REMARK: be sure that we have received the payment for your booking before the time limit stated on the reservation status page, as we still have to process the reservation in order to produce the e-tickets after your payment has been received. Unfortunately this also takes some time, so we hope you are able to pay as soon as possible. As soon as we have received your payment, we will work hard to send you your e-tickets as soon as possible. When they are ready, we will inform you about it via email. I wish I could tell you that I booked my flights with TicketIndonesia, got onto the flight and everything went smoothly, but I never even finished my transaction. Here’s why. After receiving the reservation email from above, I logged back onto their site with my booking number and last name to pay for my tickets — that’s when I decided to cancel my reservation (they never had my credit card info). My problem was with their “reservation fee” and “application fee” that was tacked onto the fare price. My quoted price when I initially requested my ticket was 816,000 Indonesia Rupiah, which is $59.11 USD at the time. The total airfare displayed on my TicketIndonesia invoice was 74.69€ which is $81.32 when converted into U.S. Dollars. In total dollars, the service fee is $22.21 — but that percentage of the total airfare is approximately 35%. Let me put that together so you can be as bothered as I am when typing this: THAT’S A 35% RESERVATION FEE which if you don’t get a sense of my annoyance and irritation from the bolded, all-caps emphasis — is RIDICULOUS. And after looking at their “Fees for booking e-tickets” page where they publish out the fees they charge, it still didn’t make any sense. According to the above table, I should have been charged 9 € or $9.78 USD, but somehow I was being charged 20.43 €. Listen, whether a flat fee or a percentage of the airfare, I know full well that I was going to have to pay some form of convenience fee using their service, but 35% is outrageous considering the price. If my airfare was for two tickets at a total of $250, that’s fine, but 35% of ticket is plainly ridiculous. Though I didn’t go through with my purchase, I’m confident that TicketIndonesia.info would have come through with the tickets. Despite the obvious manual process behind the scenes and a process that’s too many steps in this day and age, their response time was good and the site fulfills the need to pay for Indonesian airline tickets from the United States. For me, the service charge was way too much for me to digest.